In September, the chemistry department dedicated a conference room in honor of the late Fred Basolo, a pioneer in inorganic chemistry and one of Northwestern’s most beloved professors and mentors. He died in February at the age of 87. At the dedication of the newly refurbished room, K-140 in the Technological Institute, “chalk talks” were given by two prominent alumni of the department, Harry Gray, California Institute of Technology, and Kenneth Raymond, University of California, Berkeley. Both had been graduate students in Basolo’s lab. The informal talks, marked by a creative exchange of ideas, were in a collaborative style which had characterized Basolo’s career. His family members were present as a plaque was placed outside the room in Basolo’s memory. 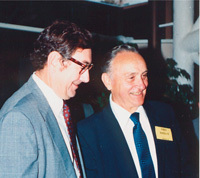 Those gathered—chemists, students, family, and friends—remembered how, in 60 years at Northwestern, Basolo helped shape his department into a leader in inorganic chemistry, as other leading chemists were attracted to Northwestern by his reputation and his personality. Basolo joined the University in 1946 after working on a classified military research project during World War II. Named the Charles E. and Emma H. Morrison Professor of Chemistry in 1980, he was internationally recognized for advancing understanding of the basic chemistry of transition metals, such as iron, copper, and zinc. In the early ’80s, he was elected president of the American Chemical Society (ACS) by an overwhelming majority, despite being a write-in candidate for the position. In 2001, he received the society’s Priestly Medal, its highest honor. More than 400 scientific journals published his work. His Coordination Chemistry, written with Ronald C. Johnson, has been referred to as the bible of inorganic reaction mechanisms. Mechanisms of Inorganic Reactions, co-authored with Ralph G. Pearson, has been translated into nine languages. A member of the National Academy of Sciences and a fellow of the American Academy of Arts and Sciences, Basolo was known for his work in coordination chemistry, studying the complex shapes and reactions of the transition metals, which did not seem to follow any of the known rules for chemical reactions. His studies of the way these metals coordinated organic compounds helped lay the groundwork for the field of homogeneous catalysis. His fundamental research has led to the development of new cancer drugs and has had important industrial applications. An international reputation afforded him the opportunity to help forge a bond between the scientific communities of the United States and the People’s Republic of China in the 1970s and ’80s. Basolo was born in 1920 to Italian immigrant parents. Coello, a small mining town in southern Illinois was home to families like his from the Piemonte region of Italy, and Basolo spoke a rare dialect of Italian before speaking English. A high school home economics teacher reinforced his interest in chemistry when she allowed him to use the lab on Saturdays for his own experiments. During college at Southern Illinois University, he worked odd jobs, some provided by President Roosevelt’s WPA program. For graduate school at the University of Illinois, Urbana-Champaign, he studied under John C. Bailar, considered a father of coordination chemistry. In 1943, he received his PhD in chemistry after only three years of study, his course accelerated so that he and fellow chemists might help the war effort. Those wishing to honor Professor Basolo with a donation for the newly renovated conference room should contact the Weinberg Development team at 847-467-3737. Funds will be used for upkeep and ongoing improvements. A check for this purpose can be made out to Northwestern University with Chemistry K140 Renovation Fund in the memo section and sent to Weinberg Development, 2020 Ridge Avenue, 4th floor, Evanston, Il 60208.